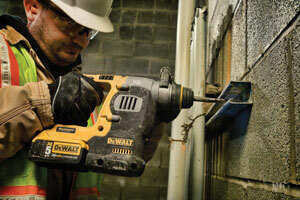 When working with concrete and other masonry, a regular cordless drill literally (and figuratively) won’t cut it. This is where rotary hammers truly shine. Choosing the best rotary hammer drill can be tough, but we’ve taken the guesswork out with this list of heavy duty gems. Rotary Hammer vs Hammer Drill – What’s the Difference? What are Some Common Types of Attachments? 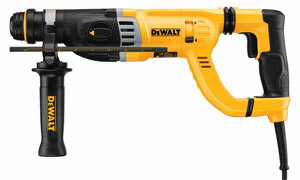 Kicking off our list is the DCH273B, a high performance, cordless 1-inch rotary hammer. Featuring a powerful DeWalt brushless motor capable of a no load speed from 0 to 1,100 RPM and 0 to 4,600 blows per minute (BPM), the German engineered mechanism provides an impressive 2.1 joules of impact energy. You won’t feel the effect of this power, thanks to its SHOCKS Active Vibration Control technology and optimized ergonomic design that makes overhead drilling a snap. Topping off the list of features are a retractable utility hook and factory-set clutch. This is perhaps the best rotary hammer drill for concrete, with consumers reporting very quick job times in even tougher concrete. When paired with a 60-volt battery, the tool is almost unstoppable. While corded models have a higher impact energy rating, you simply can’t beat the versatility of this cordless model. 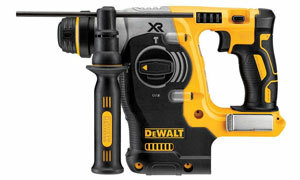 And this DeWalt is the very best cordless rotary hammer drill out there. The only real downside to this model is the limitation to serviceability. Many parts have to be bought in units due to way they’re welded together. This can result in long wait times at service centers. Some parts can also be almost as expensive to replace as the rotary drill tool itself, making this one tool you might prefer to rent if you have limited use for it. This 1-1/8 inch rotary hammer drill packs amazing power for its weight, boasting 2.6 foot-pounds of impact energy. Active Vibration Control reduces strain when working for long periods of time. An exclusive Vario-Lock lets you choose from 12 different positions while the tool’s in neutral, while the 360 degree auxiliary handle and variable speed 3-finger trigger gives you better control over tasks. The multifunction selector rounds off this impressive tool’s perks. Capable of carving through solid stone with ease, this roto hammer is a mason’s best friend. Owners have used this tool on everything from granite to old concrete with equally impressive results. At a much lower purchasing price, the RH328VC is an excellent investment. Unlike earlier models, the RH328VC can be a real hassle when something breaks. Parts are no longer sold individually, and you must purchase entire assemblies, making repair more expensive. While this is still a great tool, this decision by Bosch can make the drill expensive to maintain over time for some industrial applications. 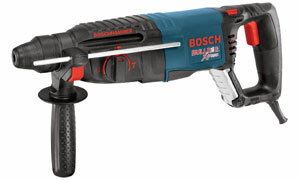 Fortunately, the Bosch is one of the most durable models out there. This powerful rotary hammer’s 8.4 Amp motor produces an incredible 5.9 foot-pounds of impact energy and 950 watts of input power to help you tackle the toughest jobs with ease. Speeds reach 510 RPM at no-load and the tool provides an impact rate of 2,800 BPM. A low vibration level of 18.8 m/s2 and noise level of 95.2 dB means a more comfortable and quieter work experience than much of the competition. One simple knob turn allows you to switch between hammer and roto hammer modes, turning this tool into a mini jackhammer. In the event of a bound bit, the safety clutch will shut down rotation, prolonging the life of the tool and improving user safety. Don’t let the lighter weight fool you, this little tool can pack a lot of punch! Owners have reported the DH38YE2 matching rotary hammers with twice the weight for speed and efficiency. The gentler vibration also means you can use the tool all day long with minimal discomfort. 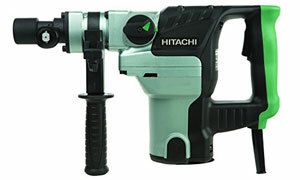 At some point, Hitachi shifted production of this tool from Japan to China. Those produced after the move have fewer bearings and less metal in the construction. When possible, see if you can get the Japanese produced model which should last longer. This 1-1/8 inch rotary hammer drill has an 8.5 Amp high performance motor that produces 3 joules of impact energy. Despite this high impact capability, the inclusion of the SHOCKS Active Vibration Control and integral clutch means it won’t feel like your arms are made of jello by the end of the day. A rotating brush ring allows the drill to deliver full speed and torque in both forward and reverse. The D25263K decimates tile, concrete, and stone with ease. Consumers report clearing an entire bathroom in as little as 15 minutes, and easily tearing into stone. When you want a no-nonsense, heavy duty tool that gets the job done, this should be at the top of your list. 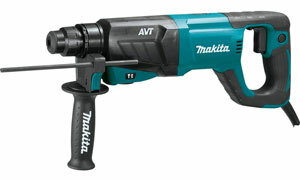 This drill works well as a hammer drill or rotary hammer, but it isn’t the greatest when used as a normal drill. At least one consumer has also had problems with the vibration causing the setting to slip from one mode to another while in use. Operating at 0 to 1300 RPM, 0 to 5800 BPM, and 2.0 foot-pounds of impact energy, the Bulldog’s small size can be misleading. Its multi-function selector allows you to choose between hammer only, rotary hammer, or rotary only, while the variable speed trigger improves both starting and removal with its reverse support. Thanks to the SDS-Plus bit system, changing drill bits is a snap without loss of grip or energy transfer, and the vario lock positioning offers 36 different positions. This rotary drill has a lot of kick but can also take a beating. Owners of this tool have noted that it can tackle some difficult materials with ease, and use it in a wide range of commercial and residential applications. The special SDS bits are worth the price, as they won’t vibrate like a normal bit when drilling into harder materials, allowing you to complete jobs in a fraction of the time. This can be a really great tool, but it lacks enough bite to handle reinforced concrete. While this won’t be an issue for the average user, it may cause a dilemma for industrial users. Built for durability, this 1-inch drill can cover a wide range of applications. The 8 Amp motor can deliver 2.1 foot-pounds (2.9 joules) of impact energy, but you won’t feel it thanks to the Anti-Vibration Technology counterbalance system and integrated damper spring. This tool is such a treat to use that some owners feel they would have benefited from a warning label telling them how much enjoyment they’d be getting from breaking up concrete. Add in the multiple function settings and high durability, and this tool’s an all-around winner. In fact, the HR2641 is so well-made that the only downside one can come up with is its lack of a reverse setting. A good rotary hammer isn’t to be underestimated, as these tools pack a lot of punch. Unlike many tools which are a one-trick pony, a good rotary drill can perform the tasks of multiple tools. Attachments expand the potential even further. The following information will help you get the most out of your new rotary hammer. Regular Hammer drills might seem similar at first, but there are a few key differences that make them stand apart beyond the pricing. A rotary hammer is the industrial big brother of hammer drills, providing higher and durability by using air pressure created from a crankshaft and piston assembly. Hammer drills are designed for lighter tasks and are better suited to home use. They also have more limited functionality, as many rotary hammers have settings that allow them to function as a standard drill or hammer drill in addition to their core function. 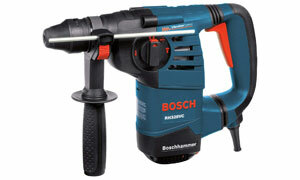 There are numerous bits and attachments you can use with a rotary hammer, each designed to tackle specific jobs. Here are some of the most popular ones and what they do. Bull Point Chisel – These bits are ideal for starting holes in concrete. Clay Spade – When attached to a roto hammer, this attachment can break up hardened soil with ease. Cold Chisel – When you want to break up concrete, this attachment is the perfect choice. Scaling Chisel – As the name implies, this attachment is used to remove rust, scale, and weld splatter. Tile Remover – This attachment is perfect for when you need to remove ceramic tile.